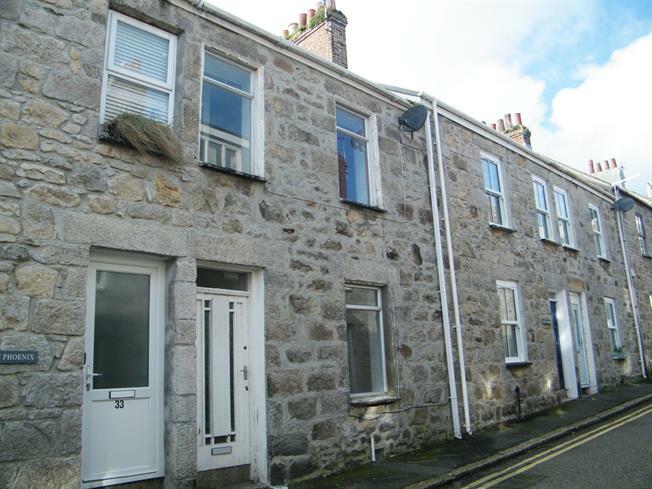 Terraced Cottage For Sale in St. Ives for Guide Price £240,000. A two bedroom mid terrace cottage which is in need of some modernisation, however does have gas heating and is partially double glazed. The accommodation of this cottage comprises in brief of; An entrance hallway, a spacious living room, a study/snug living room, and a kitchen on the ground floor. On the first floor there are two bedrooms and a family bathroom on the second floor there is an attic room. To the rear of the property is an enclosed courtyard. This cottage would make a great bolt hole, buy to let investment or low maintenance home. A part glazed entrance door leads into the entrance hallway with exposed floorboards, part carpeted staircase leading to the first floor and a door leading into the living room. Living room with exposed floorboards, a double glazed window to the rear overlooking the rear courtyard, a radiator and a under stairs storage cupboard. From the living room a door leads into a study area. A range of wall and base kitchen units, with tiled flooring and splash backs, a single stainless steel sink with drainer, a four ring electric hob with overhead extractor and single oven. There is a double glazed window overlooking the courtyard and a double glazed door leading into the courtyard. A staircase leads to the first floor landing with carpeted flooring a radiator, a double glazed window to the front, a useful under stairs storage cupboard. Doors leads off into the two bedrooms and family bathroom. A family bathroom with p-shaped bath with shower over with tiled surround and a glass screen, a push button flush toilet, a pedestal wash hand basin, a heated towel rail and a frosted double glazed window to the rear. A cupboard houses the gas combination boiler. A double bedroom to the rear with exposed floorboards, a radiator and a double glazed window to the rear. A bedroom to the front with exposed floorboards, a radiator and a single glazed window to the front. A staircase leads to the second floor. A attic with a vaulted ceiling, exposed floorboard, a double glazed velux window to both the front and rear and access into the eaves storage area which is boarded. To the rear of cottage is an enclosed rear courtyard with a useful storage shed.